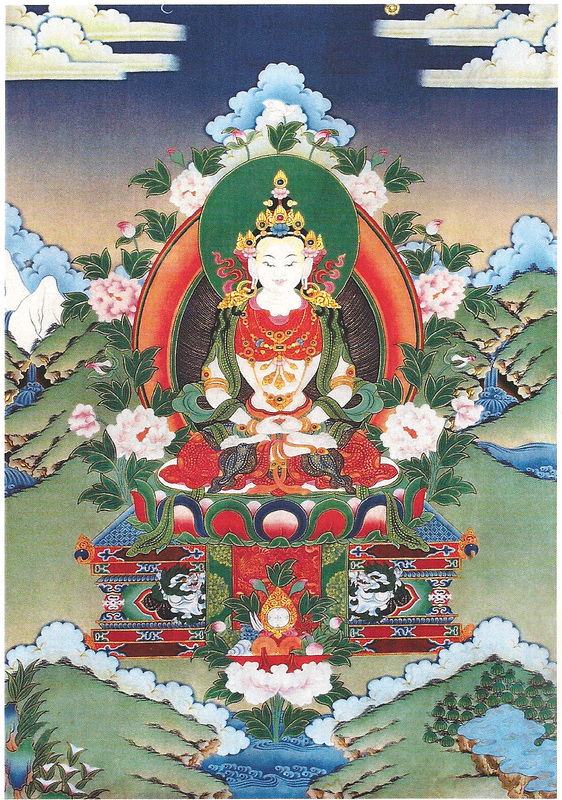 The Enlightened deity, Shenlha Okar, embodies all perfected, positive qualities. In the Yungdrung Bön tradition, the practice of the Ten Perfections has vast and profound benefits. For example, in the Mother Tantra it is said that the practice of the Ten Perfections is one of the primary practices in order to prepare for the intermediate state after death. The Ten Perfections are: Generosity, Moral Discipline, Patience, Diligence, Concentration, Power, Compassion, Aspiration, Skillful Means and Wisdom. 1- Generosity: In Tibetan, Jin pa. There are three kinds of generosity: 1-generosity with possessions, 2- generosity of giving protection, and 3-generosity of sharing the sacred teachings. This kind of generosity is without expectation of anything in return and therefore diminishes attachment and self-centeredness. In the Yungdrung Bön tradition, there are four daily practices of generosity: offering of purifying smoke, the water offering, offering of burnt food, and the symbolic offering of one’s own body. 2- Moral Discipline: In Tibetan, Tsultrim. In general, this refers to ethical behavior and the practice of discipline in abandoning the non-virtuous activities of body, speech and mind. There are external, internal and secret teachings related to moral discipline. 3- Patience: In Tibetan, Zöpa. This refers to being patient and accepting of others as well as being patient with our own spiritual practice and development. Additionally, it is the practice of being patient when we are suffering. 4- Diligence: In Tibetan, Tsöndru. Specifically, it is an energetic and enthusiastic kind of effort. The feeling of joy in performing any kind of spiritual practice or virtuous action is the practice of diligence. If you are not enthusiastic about something, even a small hindrance can feel like an insurmountable obstacle. 5- Concentration: In Tibetan, Samten. In order to fulfill any intention, it is important to have the ability to focus and to not become distracted. Concentration is needed for both study and meditation. 6- Power: In Tibetan, Tob. Whatever practice or virtuous activity that you are performing, you need energy and strength. This is the opposite of lack of confidence. 7- Compassion: in Tibetan, Nyingjé. Whatever specific practice we are focused upon, our foundation should be compassion. Specifically, compassion is the heartfelt wish that every sentient being be released from their suffering and misery. 8- Aspiration: In Tibetan, Monlam. In this practice, we cultivate a sincere wish for our spiritual development and realization so that we can be of benefit to both our self and others. This practice inspires us to continue. Aspiration can be as vast as possible. It does not mean that it is something that has to be accomplished in this lifetime. For example, we develop compassion and pray that we may be of benefit to all sentient beings. Once enlightenment is attained, enlightened beings return to help sentient beings due to the power of their previous aspiration and not because of any force of desire or karma. 9- Skillful Means: In Tibetan, Tab. In general, this refers to the act of dedicating the merit of all of the virtuous activity of our body, speech and mind for the benefit of each and every sentient being without exception. Dedication is the skillful means to prevent exhausting the merit that has been accumulated during our practice. 10- Wisdom: In Tibetan, Yeshe. In general, this refers to understanding the laws of cause and effect and discriminating between accepting or rejecting actions according to their virtue or non-virtue. Principally, it is understanding the ultimate view, the true nature. “Having cleansed all defilements of the conceptual mind, may non-conceptual wisdom arise within my mind-stream! Having pacified all obstacles to virtue and all adverse circumstances, may I accomplish all my wishes and complete the ten virtues! Having spread the teachings and lived a long time, may I benefit all sentient beings who come into contact with me! Posted on October 23, 2015, in Prayer and Ritual, Translation. Bookmark the permalink. 2 Comments. I looked for an explanation of the ten perfections, and what should I find and b who was it done. Thank Raven for manifesting this work.